Digital Source: Rotel RCD-971 CDP as transport, PS Audio DL III DAC w/ Cullen Circuits Stage Three Mod, Audio Zone DAC-1, Shanling PCD3000A. Analog Source: Pro-Ject RPM 5 turntable, Pro-Ject Speed Box, Pro-Ject Tube Box phono stage, Ortofon Rondo Blue cartridge. Amps: Audiomat Opéra Référence integrated, Wyred 4 Sound SX-1000 monos [on loan]. Speakers: Green Mountain Audio Callisto (on sand filled Skylan stands), (2) REL Q108 Mk II subwoofers, AV123 Strata Mini. Cables: SilverFi & JPS Labs Superconductor+ interconnects, Auditorium 23 and JPS Labs Ultraconductor (double biwire) speaker cables, Belkin Synapse digital, Crystal Cable Bridge [in for review]. AC Cables: Audience powerChord 'e', GutWire Power Clef, Harmonic Technology AC-10. Powerline conditioning: BPT Pure Power Center with Wattgate, Bybee Quantum Purifier and ERS cloth options, Audience aR1p AC conditioner, GutWire MaxCon. Sundry accessories: Grand Prix Audio APEX footers, Acoustic Revive RR-77, Isoclean fuses, Caig Pro Gold, Auric Illuminator, Audio Magic/Quantum Physics Noise Disruptors, dedicated AC line with Wattgate 381 outlet, Echo Busters acoustic room treatments. Room size: 11' x 18' x 8,' long wall setup, suspended hardwood floors with large area rug, walls are standard drywall over Fiberglas insulation. Hyperion is a relative newcomer to the audio scene that has quickly garnered considerable success with their highly regarded HPS-938 and 968 loudspeakers. Both products and the HT-88 mono amplifiers have been favorably reviewed at 6moons and elsewhere. The HPS-738 is a new and less expensive loudspeaker that shares many of the unique features of the larger more expensive models. The HPS-738 is a 3-way bass-reflex floorstanding design aimed at smaller listening rooms. Measuring 38 5/8" high by 9" wide and 12" deep, the HPS-738 weighs in at an easy-to-move 52.8 pounds. While appearing to be well constructed with a high level of fit and finish, this speaker possessed not one of the more inert enclosures I have encountered. However, many loudspeaker designers massage cabinet resonances as part of their voicing process and this may have been the case here. Let's just say that I was certainly aware of the cabinet's influence on music playback during the review process. The HPS-738 ships with heavy brass feet that terminate in contoured disks instead of sharp spikes. While I can appreciate Hyperion's desire to avoid punching tiny holes in floors of customers, bass performance was tauter and more focused when I swapped out the wobbly stock feet with any of the other carpet-piercing spikes I had in my audio toolbox. Why not ship this speaker with sturdy spikes and throw in a set of disks for those who wish to protect their floors? The sloped upper portion of the cabinet housing the tweeter and midrange driver is sealed from the lower bass cabinet and vented to the rear via a small circular port that Hyperion calls a Rear Pressure Reduce Device (R.P.R.D.) "to minimize rear pressure reflection influence". The lower bass cabinet with its twin side-firing woofers vents via a wide slot port on the front baffle. Channeling Henry Ford, you can have the 738 in any finish as long as it is black in a subdued mat finish. However, the somewhat meager information on Hyperion's website indicated that a custom sandalwood finish is available, too. On the rear a recessed housing contains two pairs of sturdy metal binding posts for biwiring along with the ubiquitous cheesy brass shorting straps. The crossover is mounted directly to the rear of this housing and potted in an epoxy to, I suspect, reduce the effects of resonance. Internal wiring appeared to be solid core copper of two different gauges attached via push-on clips. A removable plastic frame grill attaches to the front baffle with the dreaded plastic push-in knobs. At this price, I expected to see a sturdier, magnetically coupled grill. I left the grill off for the duration of the review period. Claimed frequency response is 35Hz-20kHz (no -3dB tolerance furnished) while sensitivity is 90dB and impedance ranges from 4 to 8 ohms. Crossover points are 200Hz and 3kHz. The 738 uses the same 1" silk dome tweeter and 6½" carbon fiber midrange driver as the upscale HPS-968. Bass frequencies are handled by two side mounted, horizontally opposed, metal-rod connected 6½" woofers. All drivers are on 1st order filters. As with Hyperion's other speaker models, the HPS-738 feature some interesting technologies I have not seen elsewhere. Instead of the more common cone or dust cap covering the voice coil, their midrange driver has a flat disc coupled directly to the voice coil to convert the center section into an active part of the driver. This Syncro Vibrate Flattop (S.V.F) supposedly offers ideal pistonic motion with greatly reduced breakup distortion at high volumes. Furthermore, this S.V.F. driver has no spider to couple the voice coil to the diaphragm. Instead, it adopts a Magnetic Fluid Damping System (M.F.D.S.) said to increase the driver's power handling and speed. With their side-mounted woofers, I expected some difficulty finding the optimum position in my room. However, this was not the case. After a little shuffling about, they ended up within two or three inches of where most speakers sit, 50' from the front wall and 23' from the sidewalls. 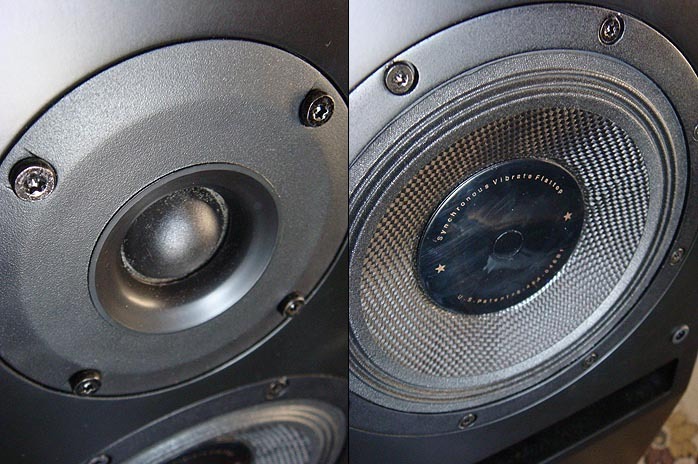 Image lock and soundstage definition were best with the speakers toed in, with just an inch or two of the inside panels visible from the listening position. Partnering amps included my Audiomat Opéra Référence integrated plus the Wyred4Sound SX-1000 monos run directly from a Shanling PCD3000 CD player through its variable analog volume control. Both amps matched fine with the Hyperions and I could easier hear their different sonic characters. 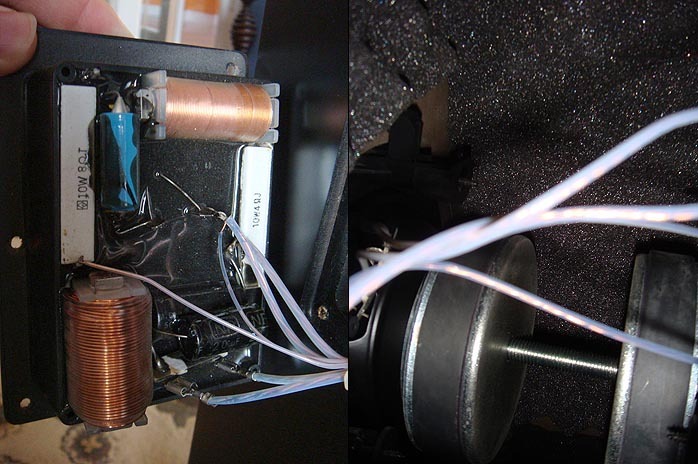 While I tried biwiring the 738 with a double set of JPS Labs Ultraconductor, I did not note any major improvement and instead stuck to my single run of Auditorium 23 cable with a set of DIY jumpers constructed of DH Labs T-14 silver-plated copper wire and Cardas spades. Biwiring might have offered better performance with a more complex crossover. As with many loudspeaker models however, I think this is more of a marketing than real concern. Better spend a set budget on a single good speaker cable than two lesser ones. According to Hyperion's Albert Wu, expect at least 100 hours of run-in time. I dropped them into my T.V. system for the first few weeks before moving them into Paul's Sonic Temple. Right from the start, the Hyperions impressed with their forgiving and sweet balance. 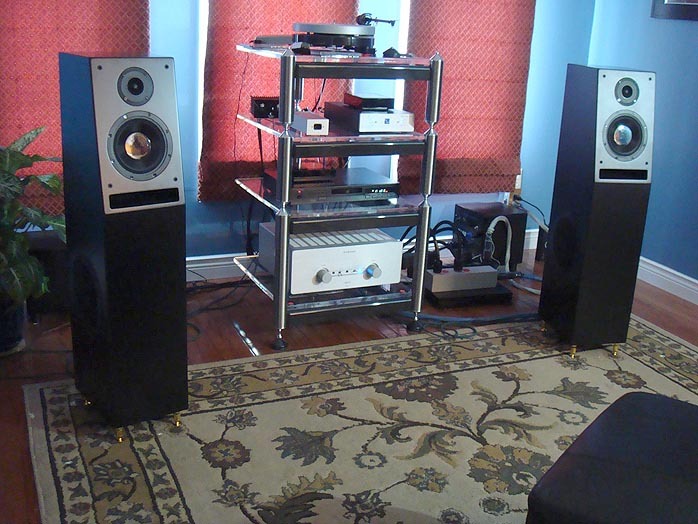 In fact, they were among the most pleasant loudspeakers I have listened to in a long time. They threw a stable fairly well delineated soundstage with focused, realistically proportioned images and a convincing sense of scale. No fifty-foot pianos here. Perspective was mid hall. The HPS-738 delivered a good sense of weight and solidity and displayed a fairly even tonal balance, leaning slightly to the warmish side. While the 738 did not possess the most explicit top end, the highs were silky smooth and never etched or shrill. In fact, it was impossible to make this speaker bright or edgy regardless of playback material or partnering equipment. Even my son's near ancient 30wpc Rotel receiver failed at it. Bass was deep, tuneful and extended if a little loose. Occasionally I noted a slight one-note bass effect. Nevertheless, low-pitch percussion instruments such as kick drums, floor toms and timpani sounded terrific with excellent weight and definition. The midrange was all ear candy; smooth, sweet, even lush yet always musical. Voices came across well. I noted no exaggeration of sibilants. Imaging was stable and precise but not sharply etched in stone, which to me would be more a sign of hifi artifacts than musically relevant. As sweet and pleasant as the Hyperions were, I occasionally did wish for a little more piss and vinegar.